Even if you’re only a passing fan of Lucasfilm’s time-honored juggernaut, you’ll struggle to find anyone who wouldn’t agree that Star Wars is one of, if not the biggest brands in entertainment. A full 40 years on from the release of A New Hope and the franchise continues to grow and evolve in exciting new ways, with Rian Johnson’s Star Wars: The Last Jedi set to be the next mainline entry in Disney’s timeline. Pegged for December 15th, all eyes are beginning to turn toward Star Wars Celebration Orlando, where the Mouse House is expected to lift the curtain on The Last Jedi‘s inaugural teaser. And though it’ll no doubt bring the Internet to a standstill next month, SWCO isn’t merely a showcase of Rian Johnson’s sci-fi sequel. Presentations for Star Wars Battlefront 2 (and perhaps Visceral’s licensed title?) are also on the cards, that much we know, but Disney’s annual event will also welcome a new line of products in the Force For Change charitable initiative. First spotted by CBM, these include a new licensed T-shirt and The Last Jedi pin, both of which will be available to purchase at Star Wars Celebration next month. 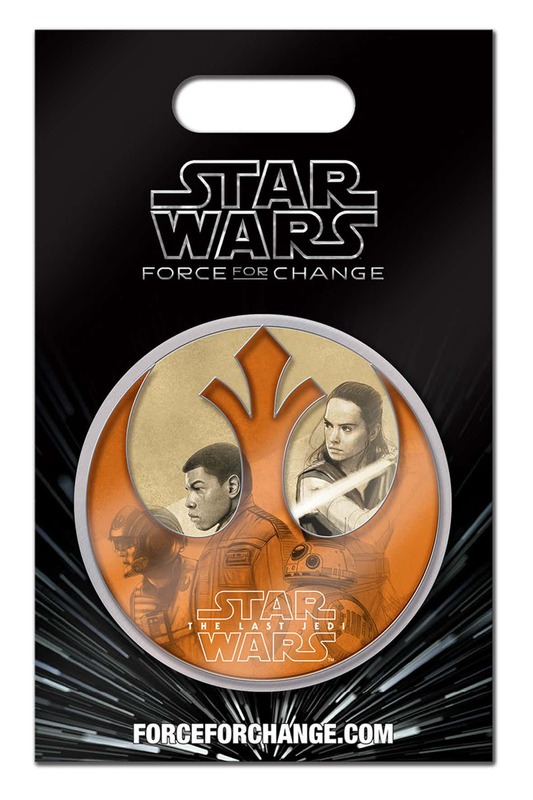 Per Lucasfilm, “25 percent of the retail sale price from each product will be donated to the U.S. Fund for UNICEF in support of UNICEF Kid Power,” and you’ll be able to take a closer look at each down below. 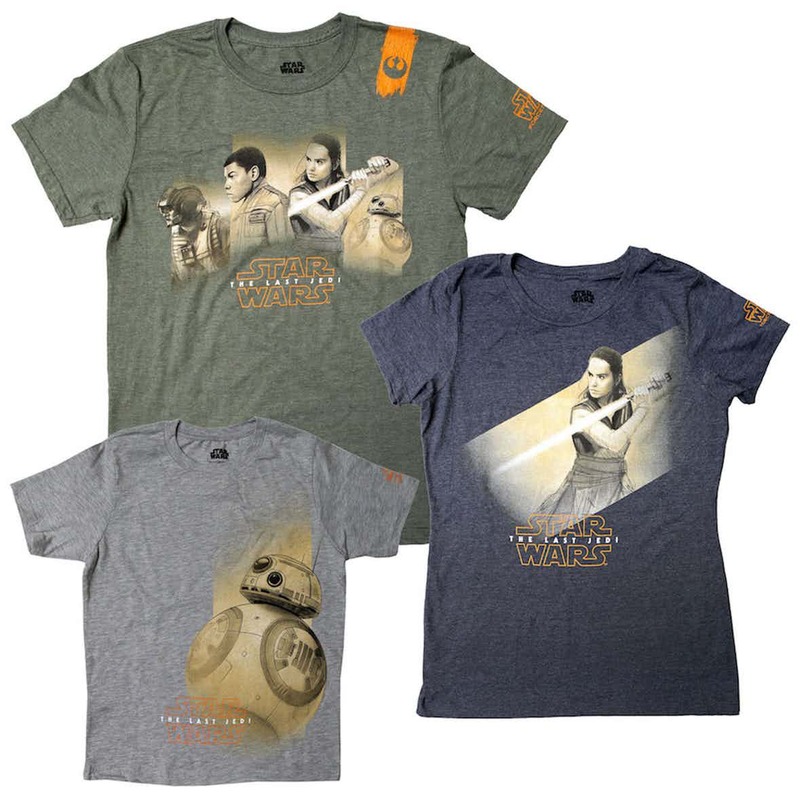 There’s not an awful lot to go on here, of course, but these pieces of memorabilia do offer another peek at BB-8, Finn, Poe Dameron and Daisy Ridley’s Rey clutching on to a Lightsaber. Star Wars: The Last Jedi will invite moviegoers back to that iconic galaxy far, far away on December 15th.